Life, DLG style: Coffee anyone? April has been a busy month for us. We spent another weekend in San Antonio, this time, for "Mom's Night Out". My best friend Brandi and I got a hotel room downtown and partied the night away! Ok, we were in by midnight. We can't hang like we used to! It was my first night away from Jon David and I was nervous. Of course, all was well and Jon David was so busy playing with family, I doubt he missed me at all! I missed him terribly right before I fell asleep. I am so used to checking on him before I go to bed. I was worried he would decide to start walking and I'd miss it. Every time we see his cousin Ella (who is 2 months older), he comes home with new skills! She is walking now, so I thought I might miss his first steps. I didn't miss any milestones, so I guess it is ok for me to get out every once in a while! Jon David's big thing now is drinking out of a cup. He does a pretty good job! If you are drinking it, he wants some! He can even drink out of a (water) bottle. 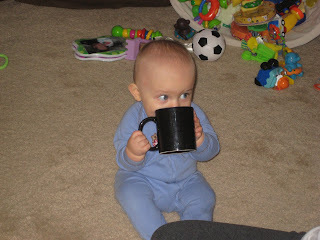 Not to be worried, there was water in that coffee mug! We are in the process of trying really mushy cubes of food that he can feed himself. These are times I'm glad for our dog Shelby, who loves to clean the kitchen floor!